Mr.Ratha, Head of the Thamileelam Film Distribution Unit released the first copy of the "Amma Nalama?" a film produced by the Nitharsanam Television Unit of the Liberation Tigers of Tamil Eelam last Thursday evening at the Trincomalee Town Hall. The Chief Priest of the Trincomalee Pathirakali Ambal Temple Bramasiri S.Ravichchandrakurukkal received the first copy. 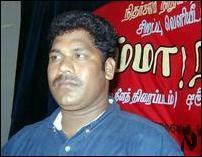 Mr.N.Kesavarajan directed the film, sources said. 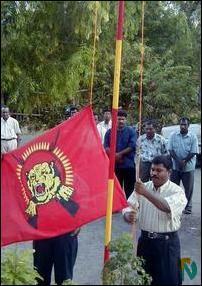 At the commencement of the event TEEDOR Trincomalee district head Mr.S.Tharman hoisted the Thamileelam national flag. Hindu priests and other guests lighted the traditional oil lamp. Mr.Ratha in his address prior to the release of the film said, "LTTE cadres go to the battlefront with arms to liberate our motherland; another batch of cadres follow them with cameras to record the historic events. In addition to fighters we have lost almost sixty of our film crew when recording these events in the battlefield." Films should protect the cultural and human values. Film producers should bear this noble concept in their minds, said Mr.Ratha. "We will not do any harm to others. We will not betray our people. But we will not allow others who betrayed our people go unpunished," said Mr.Ratha. TEEDOR district head Mr.Tharman said the outcome of the last general election has proved that chauvinist elements in the south would not allow a political solution to the Tamil national question through negotiations. The emergence of a Sinhala nationalist group Jathika Hela Urumaya has clearly indicated that any solution to the conflict should be found on the basis that the country belongs to Sinhala Buddhists. The United National Party was thrown out in the last general election because it had started negotiations with the LTTE to find a peaceful solution to the conflict, Mr.Tharman said. 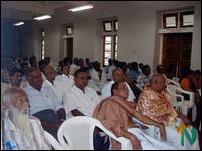 Attorney-at-Law Mr.K.Sivapalan, Mr.S.Vilvaretnam, Mr.Nathini Xavier and Mr.Nilathamilinthasan also spoke. 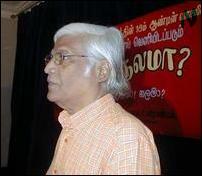 Dr.Raja Tharmarajah presided. Mr.Thennavan, head of the Trincomalee district Martyr's Unit proposed vote of thanks.